Imagine if you were taken out of your home and dumped into an environment where you didn’t know the language or customs. No matter how hard you try, you only learn to understand a few of the words used in your new home and are unable to speak any of them. Some of what you say in your own language seems to be understood, but your new family misunderstands a lot more of it. They get angry at you for so many things that you do, but you don’t understand what they want you to do instead. That’s a frustrating and scary thought, isn’t it? That’s how your new puppy or adopted dog feels when you bring him into your home. And that is what forms the foundation of the training philosophy and mission at The DogSmith. Owned and operated by Lina McGroarty and her husband Chris McGroarty, DOG WILLING Positive Training Solutions – The DogSmith of Northeast Orlando, is committed, with the help of their many gifted trainers, to putting their training philosophy into practice every day. Their emphasis is on teaching you and your dog the skills that will allow you to better communicate with each other. Just imagine how great that will be! At The DogSmith the focus is on your relationship with your dog, how to improve it, and how to motivate your dog to be WILLING and eager to perform the behaviors you want. They do not use punishment, or any force, fear, pain or intimidation. Their training tools include food, toys, praise, or whatever motivates your dog with joy, not corrections. Instead of concentrating on telling your dog what NOT to do, their science based methods teach appropriate alternative behaviors that you want him to do. These methods and techniques give your dog the basic socialization and structure that he needs to feel secure, confident, and relaxed in all social situations. The goal of The DogSmith is to help YOUR dog become the best family pet ever! Lina began mentoring with the late Leah Roberts, who founded DOG WILLING Positive Training Solutions, a dog training service now owned and operated by Lina and Chris along with their DogSmith of Northeast Orlando. It was at that time that force-free and positive reinforcement training developed into an essential part of Lina’s everyday life working with not only canines, but humans and her loved ones as well (just ask Chris!). Lina maintains a particular driving passion for developmental learning in children and dogs and she specializes in puppy socialization and family group training. 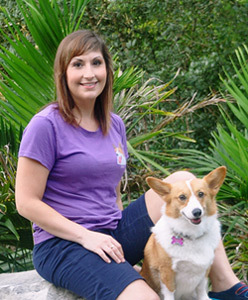 Chris and Lina live in Oviedo and are the proud pet parents of Mackenzie, the grumpy senior Rotty mix; Demi, the bossy and spunky Pembroke Welsh Corgi; and Kiran, the spastic and adventurous Shetland Sheepdog. Lina received her BA from Mount St. Mary’s University; is a Certified Professional Dog Trainer-Knowledge Assessed (CPDT-KA); a student of DogNostics Career College; an Official Mentor Trainer for CATCH Canine Trainers Academy; a member of the Central Florida Force-Free Trainers Network; and a Full Member of the Pet Professional Guild.